Television host-slash-racecar driver Mike Potenciano bested other racing enthusiasts in the first round of the Ford Focus-TRS Race of Champions. Potenciano posted a record of 34.83 seconds on a slalom-style racetrack at the Alabang Town Center on board a Ford Focus TDCi racecar. The host of Speed TV received a special award for being the only participant who finished the track in less than 35 seconds. But since the media category was timed based on team performance, the first place went to Iñigo Roces of AutoIndustriya and Chris Van Hoven of C! Magazine. Team Auto Review composed of Kit Joaquin and Alvin Ng landed on second, and Team Manila Bulletin with Anjo Perez and Aris Ilagan came in third. In the Ford Focus-TRS Race of Champions consumer category, Bobby Horrigan bagged the championship trophy for finishing in 35.26 seconds; Jaime Pedrosa, second with a time of 35.90 seconds; and Ng, third with 36.13 seconds. Winners in the category for Ford dealership representatives were JP Vargas of Ford Libis with 37.46 seconds; Paul Baradas of Ford Edsa, second with 37.58 seconds; and Hyram Dansal of Ford Alabang with 37.73 seconds. 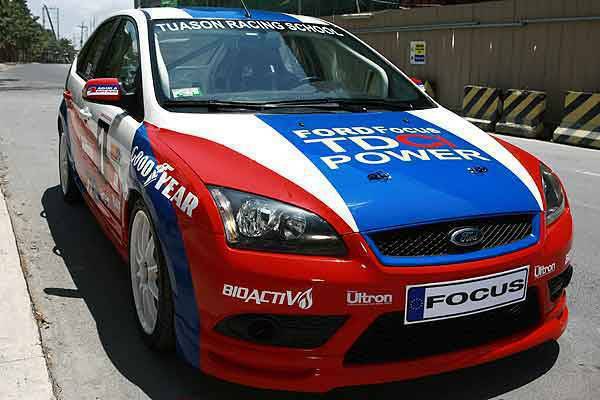 The Ford Focus units used in the race comes with a six-speed transmission and promises a maximum torque of 340Nm. "The Ford technology behind Focus TDCi's winning combination of acceleration, handling, and braking capability is what we call 'street to track' innovation. It equates superior technical capability and a dynamic nature that stands testament to our desire to make cars that are the exception to dull and drab everyday commute," said Steven Tan, Ford Group Philippines vice president for sales and marketing. The Ford Focus-TRS Race of Champions is a series of three races aimed at promoting motorsports while showcasing the features of the Ford Focus. "Over time, the results of the Ford Focus in international auto sports competitions have contributed to a robust motorsports heritage. We wish to recreate that very same excitement for Philippine racing fans as they get behind the wheel of the Focus' world-class performance," said Ford Group Philippines president Rick Baker. The next Ford Focus-TRS Race of Champions is on September 12 in Greenhills and on November 7 in Subic. Spot the Top Gear Philippines representatives!